The guidelines for Student Employee of the Year selection have been established by the National and Midwest Associations of Student Employment Administrators (NSEA/MASEA). Each year, member colleges and universities select their campus Student Employee of the Year, who then has the opportunity to compete at the state, regional, and national levels. 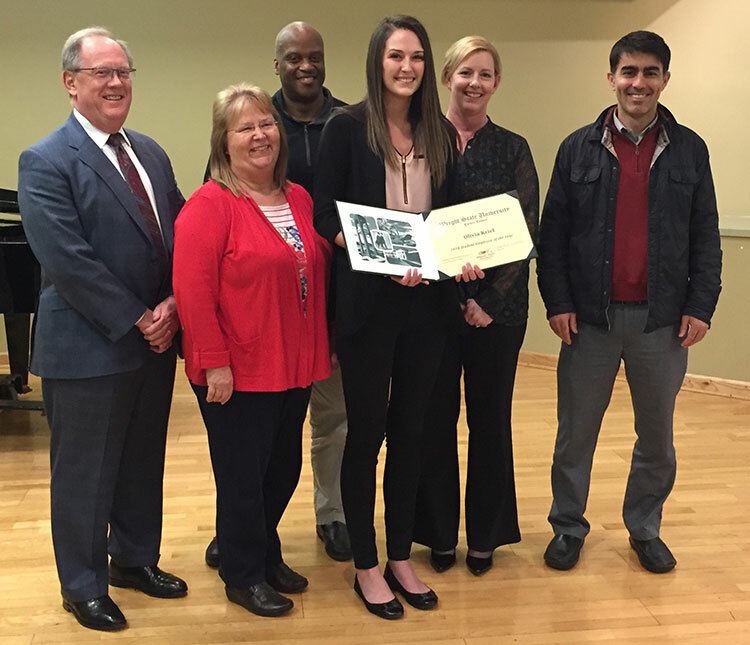 Four Wright State students have been recognized as State of Ohio Student Employee of the Year. The Student Employee of the Year (SEOTY) is a student who, in their work role, exemplifies reliability, quality of work, initiative, professionalism, and uniqueness of contribution. 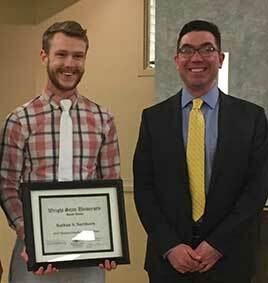 The Career Center and other members of the Wright State University community recognize the campus Student Employee of the Year at a celebration during National Student Employment Week, in April. Employers must submit the Nomination Form before 5:00 p.m., Friday, February 15, 2019. A selection committee will review nominations and select a campus winner. Undergraduate students are eligible for Student Employee of the Year. Students must have been employed through Student Employment for a minimum of six months during the eligibility period of June 2018 through May 2019. Nominees are not restricted to students employed through the Federal Work-Study Program. Student must be in good academic standing to receive the Student Employee of the Year. Please note that additional materials such as a second letter of recommendation or performance evaluations will not be considered. Fillable, savable forms are designed to be downloaded, filled in, and saved using updated versions of Adobe® Acrobat Reader®. Using software other than updated Adobe® Acrobat Reader® may result in form errors. Some users of Apple computer systems report that the data they enter does not save or appears blank when the fillable, savable form is reopened. Apple systems may be opening the form using software other than Adobe® Acrobat Reader®, causing the form to malfunction in this way. If you are using software other than Adobe® Acrobat Reader® to complete the Nomination Form, an alternative is to capture your information by filling out the form and printing it before closing it. Point out specific projects or key accomplishments. State the reasons why this student employee stands out among the rest. Describe moments when the student went above and beyond the call of duty, or made a significant contribution to the department or university. The nominee's greatest attributes, as they relate to the job. The impact the nominee has had on your department, campus, and community. The qualities of the nominee that set him/her apart from other student employees. Print out the Nomination Form, and complete it with information about the nominee, as indicated. Deliver the Nomination Form to Skip Rinehart, Coordinator, Student Employee of the Year, University Career Center, 334 Student Union. Nominations are due before 5:00 p.m., Friday, February 15, 2019. Nominations submitted after the deadline will not be considered. The campus winner will have an opportunity to be considered for the state, regional, and national award. Teresa has been working in the Registrar’s office as a Student Assistant since August 2016. Her contributions are significant and she has become invaluable to the department. She is able to understand the complex relationships between various practices in the office. Using this knowledge, she assists in on-boarding new student employees and acclimating them to the office culture and workload expectations. Teresa is professional, has a cheerful disposition, encourages her fellow student workers, office staff and all those with whom she interacts. She willingly and enthusiastically accepts additional tasks or projects and consistently delivers more than was asked without any need for recognition. Teresa has excellent communication skills, a calming demeanor and provides exceptional customer service. Teresa is also a highly involved member of the campus community and community at large. A few of her activities include President of the Relay for Life 2018/2019, Honors Community Council Member, Leader of Educators Rising, Member of the Association for the Education of Young Children, 4 Paws event volunteer and Dayton Boys Prep Academy tutor. A fun fact: Teresa’s sister also won the Student Employee of the Year Award while she was attending Xavier University. Jill Tussing, Program Director for the University Writing Center. Congratulations to all the students who were nominated and thanks to all the supervisors for nominating their exceptional student employees. Nominated by Liz Wiesman, Wright State Research Institute (WSRI). Olivia Kriel has been working at WSRI for three years. During that time, she has consistently asked for additional responsibilities to increase her knowledge of their Human Resources Department. She has created and distributed a monthly all staff newsletter, mentored and supported other student interns within the department by providing guidance and back-up support when needed. Olivia served as the main point of contact for the summer Automatic Target Recognition Center (ATRC) internship program hosting over seventy STEM students from across the country conducting research with Air Force Research Laboratory (AFRL) mentors on the Wright State campus. She was responsible for all the pre-internship welcome communications, the on-boarding process, organizing orientation sessions, providing support during the internship, and conducting the exit process and final communications when the internships ended. The feedback from the program’s manager regarding Olivia’s performance was glowing. Special thanks to this year’s selection committee: Dalila Bennett; Medical Student Clinical Coordinator, Boonshoft School of Medicine; Kurt Brugger, Assistant IT Manager, Boonshoft School of Medicine; Chelsie Spoor, Graduate Assistant, School of Public and International Affairs. Congratulations to all the students who were nominated this year and thanks to all the supervisors for nominating their outstanding student employees. Nomination submitted by Kirby Underwood, Chemistry Department. Nathan Northern has been working in the chemistry lab since 2014 preparing apparatus and chemicals for appropriate use in general chemistry teaching labs and chemical demonstrations. He has assumed a leadership role by training and mentoring new employees in the lab, served as a role model for the other students to push themselves to learn and excel, and made himself available to respond to other employees’ questions. Nathan led discussions on process improvements and demonstrated initiative by taking safety and other pertinent training modules prior to being asked. He is always ahead of schedule on tasks and immediately begins planning the next task. Nathan excels in other areas as well. He is the Treasurer of the Multi-Cultural Association of Pre-medical Students and President of CRU. He also volunteers at House of Bread, Metamorphosis Weekend, WSU Blood Drive, Raj Soin Hospital ER and the Ronald McDonald House. Even with all of these activities Nathan was on the Dean’s list all semesters of his undergraduate career and has secured early admittance to medical school. Harolynn Williams, pre-health advisor-College of Science & Math; Carleen Beckermann, Student Employment manager, Career Center; Nathan Northern; Skip Rinehart, coordinator, Student Employee of the Year award. The contributions Nathan has made to the chemistry lab will have positive implications for years to come. Harolyn Williams, Academic Advisor, Pre-Health. Congratulations to all nominees and thanks to all the supervisors who took the time to nominate their exceptional student employees. Justin Myers began working as a Research Technician in the biochemistry lab over a year ago. His natural aptitude for more meticulous work with chemicals, math and machinery quickly became apparent. He currently functions as a lab manager, and is in charge of lab equipment. Justin has saved the lab thousands of dollars in equipment repairs by diagnosing and repairing problems with some very sensitive lab equipment. He can take apart, repair, and reassemble sensitive lab equipment such as the mass spectrometer. Although an undergraduate, he has trained all of the graduate students on the lab equipment and is the “go-to-guy” for troubleshooting and repairs of the lab equipment. The graduate students seek him out to answer questions about lab protocols and nutrient data. He also excels in the field and will go the extra step without being asked, wading out in a river to collect cores or fixing the meters when they break in the field. Justin is very dedicated. He will work extra hours to help other students, volunteers to stay late to finish a project and frequently comes in early to run more samples. Justin has a deep appreciation for the natural environment. He is an enthusiastic nature photographer and one of his photographs was published in the 2016 Ohio Travel Guide. Chris Hogan, Assistant Director, Community Standards and Student Conduct. Congratulations to all nominees and thank you to all those supervisors who nominated their exceptional student employees. Nomination submitted by Amanda Watkins, Veteran & Military Center. Adrian Hill began working at the Veteran & Military Center (VMC) in spring of 2014, as the Veterans' Voices Project Coordinator. At the time of his nomination, he and his project crew had completed almost 30 interviews, which were sent to the Library of Congress. Adrian planned and implemented screenings for the project as a way to recruit volunteers and make students aware of a Veterans' Voices class being offered for summer 2015. Adrian oversees the work of others creating and editing stories for broadcast and streaming via the local National Public Radio affiliate, WYSO-FM. For his work with Veterans' Voices, Adrian has been featured in the Dayton Daily News, Troy Daily News, and the Wright State Newsroom, resulting in veterans and their families reaching out to Adrian for interviews. Adrian connected the VMC to the Montgomery County Veterans Services Commission, for collaboration on a scholarship for student-veterans. Adrian brough the Dayton Veterans Administration and local veterans organizations to campus, facilitating connections for student-veterans. In August 2014, Adrian was appointed by Governor Kasich to the Ohio Commission on Service and Volunteerism, where he votes on decisions affecting community service and volunteerism in Ohio. Nomination summited by Alaine Dunn, Emergency Medicine Department. Benjamin Clouse has worked in the Department of Emergency Medicine (DEM), Boonshoft School of Medicine since January 2013. In just over one year, Ben has become an invaluable member of our DEM team and all of its functions. Our faculty and administrators often comment on Ben’s many positive contributions to the department, his professionalism, and how well he represents the Department to those both inside and outside the School of Medicine and Wright State University itself. On many occasions, I have seen him give 100% for several hours in preparation for an event and then being the last one to leave. He is dependable and reliable beyond what you would expect from a busy student—especially one carrying up to 20 credit hours a semester while maintaining a 3.9 GPA. For example, in addition to the routine office duties, he has eagerly participated in high-fidelity medical simulation sessions. He has worked with technicians to set-up for these training sessions and participated in scenarios as stand-in nurse or medical technician in teaching simulations. In some cases performing CPR for back to back demonstrations for several hours has been required. Though exhausting work, he seemed energized. Ben has also accompanied the CIMER training team to main campus for low fidelity simulations for medical students and nursing students. In addition, he participated in a “terrorism re-enactment” staged for training purposes working with the Ohio State Patrol. The degree of reliability, work quality and professionalism that is a prerequisite for such a community activity is rarely seen in a student worker, yet Benjamin Clouse exceeded expectations. Ben Clouse has been a remarkable asset to our Department and Wright State University. This is due not only to his work ethic and accountability, but also because of his personal character. He is respectful to others and sensitive to areas of confidentiality. He shows compassion, understanding, and is of even temperament--characteristics of necessity particularly when working with medical education. Career Services congratulates Benjamin on his professionalism, hard work, and dedication to Wright State University! 2013 Wright State Student Employee of the Year: Kristopher Hyde. Nominated by Dennis J. Hance, Mechanical Engineering Program. Kris earned the award as Student Employee of the Year due directly to his outstanding work habits and willingness to ‘do the extras without being asked’. He recognizes what needs to be done – and does it! 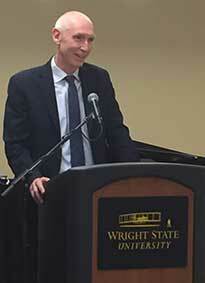 We congratulate Kris on his professionalism, hard work, and dedication to Wright State University - Lake Campus. Michael LaTorre, Graduate Student, Student Affairs in Higher Education. Exemplifying reliability, quality of work, initiative, professionalism, and uniqueness of contribution. Ashley was nominated by her supervisor, Dr. Hank Dahlman, Professor of Music, Director - Choral Studies, Director- CELIA (Collaborative Education, Leadership, and Innovation in the Arts). "During the summer of 2011, in preparation for the new building project to renovate Schuster Hall in the Creative Arts Center, we needed to free up space in the Music Wing. That summer, Ashley, along with the junior level UCA Jeeremy Bon, completely renovated and re-ordered the entire choral music library. This included culling out-of-date and/or out-of-print, and obsolete scores from the files of over 1,000 choral octavo titles (small works) and over 200 major works and anthology titles and other book-format materials. While doing so, Ashley designed and entered data for a completely revised and computerized choral library database, replacing the antiquated and inaccurate card files. She and her student assistants (many of them volunteers that she personally recruited) also completely revamped the library work areas and office space, and oversaw the installation of new shelving in the library, following up with a complete re-filing of all the remaining choral titles. This was a HUGE job, and it was done extraordinarily well, with minimum faculty supervision. In my opinion, this alone should merit an award for Ashley. "This event involves registrations from over 125 high school students representing some 25 or 30 high schools each year. Registration involves in-take and database recording of registration forms, collection of fees and delivering these the same day to the Departmental administrative assistant in charge of accounts payable, and regular contact with school directors, students, parents, and public school officials, bookkeepers, and other administrative personnel. Since this is a major recruiting event for us, it is essential that this task be handled in a highly accurate, timely, and positive and friendly way (i.e., "customer service"). Because of this, I typically have assigned this task to a graduate assistant or WSU staff member, but in this case, I had every confidence that Ashley would do an outstanding job. She absolutely delivered, and then some. Some would say it was the smoothest festival we'd ever had, and I'd agree. "Last May, the WSU Choral Program, in collaboration with the Department of Theatre, Dance & Motion Pictures and the Dayton Philharmonic Orchestra, presented a fully staged performance of MASS by Leonard Bernstein. The performances were the result of over three years of planning, and involved over 200 singers, instrumentalists, actors, dancers and technical crew. Over 80 choral singers from three different WSU choirs were involved. Ashley, along with graduate teaching assistant Amanda Hughes, oversaw all library and logistical matters pertaining to score acquisition, distribution and retrieval. The choral scores were only available as rental scores, EACH score costing $125 if not returned. Thus, we were responsible for the distribution and return of over $10,000 worth of rented scores. Ashley organized the whole thing, closely coordinating with the DPO Librarian. Needless to say, we got all the scores back from students, safely returning the scores to the DPO by the deadline. "Presently, Ashley is working as the Tour Manager for the Collegiate Chorale's presentation at the Ohio Music Education Association Professional Conference and our Spring Tour to Washington, DC and Virginia, which includes performances at the National Cathedral and Colonial Williamsburg. We will sing later this summer at the Champions Level of the World Choir Games, hosted this year for the first time in the US (as it happens, Cincinnati). As Tour Manager, Ashley is responsible for coordinating rooming lists, and contacting host organizations, providing lists of repertoire, and generally assisting me with the myriad of tasks and details, and often under strict deadlines. This is the smoothest year we've had in this regard, and yet the busiest, in over 5 years. No accident." Congratulations and thank you, Ashley Leasure! Liane Muhlenkamp, Program Officer Assistant for Teacher Education, Lake Campus. The 2011 Wright State University Student Employee of the Year is Matthew Porter. Matthew was nominated by his supervisor Marcia Wendeln, Department of Biological Sciences, College of Science and Mathematics. Matthew Porter began attending Wright State University in January 2007 and is completing his Bachelor of Science degree in Earth and Environmental Sciences this fall. He was hired in the Freshman Biology Lab in the Spring 2007 and in 2 years became the most senior lab assistant. Matt continually looks for ways to improve the educational quality of the labs. He has been instrumental in creating new lab experiments and adapting them for the needs of students with disabilities. Additionally, he has taken on an informal leadership role by training new student employees, serving as a mentor for other assistants, and supervising the growing number of outreach programs for the lab. Some of these programs include the STEMM Exploring Science program for middle school students, Tech-Fest at Sinclair Community College, Take Our Sons and Daughters to Work Day at WSU, STEMM Summer Camp for students with disabilities, and several workshops for home-school groups. His dedication, resourcefulness, and leadership have resulted in extremely successful programs. Matt takes initiative in several aspects of his job by improving lab equipment, fixing microscopes, designing methods to make experiments more effective, and searching on his own time to find materials that will help students' performance in the lab. A specific example of Matt's initiative is organizing a small team of student employees to re-build the Biology Department's dilapidated bird blind. He also got the group to commit to providing the labor and materials. Marcia Wendeln wrote in her nomination letter: "With some funding from the Dept. of Biological Sciences, Matt took the lead and they completely rebuilt the bird blind from only a frame, replacing the roof, walls, benches, and feeders. He brought in his own tools, picked up supplies with his car, and worked on Saturdays and evenings without pay to make sure the job was done. He also was instrumental in obtaining some donated supplies from Home Depot and Lowes. Although other students have helped with this project, we would not have a new bird blind in the WSU woods if it was not for Matt's extensive effort and long hours of dedication." Evelyn Lauterbach Academic Advisor, Lake Campus. 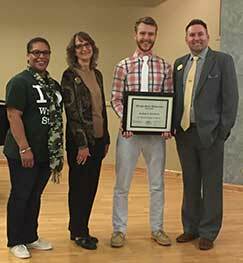 The 2010 Wright State University Student Employee of the Year is Brendan Greaney. Brendan has worked in the Office of Disability Services for two and a half years taking on numerous roles and responsibilities. Brendan’s first position was as driver of the WSU accessible minivan and his outgoing and friendly personality as well as his interest in working with students with disabilities quickly led to promotions to office assistant and programming assistant. And, he performed these duties with the responsibility and confidentiality of a professional staff member. Brendan’s commitment, loyalty, passion, strong work ethic, and friendly disposition area qualities truly valued by students and staff in Disability Services. He is a role model to other students.Brendan will graduate in June 2010 with an undergraduate degree in Organizational Leadership. He is currently making plans to pursue a graduate degree in Student Affairs in Higher Education at Wright State. Gretchen Rentz, Student Services Specialist, Lake Campus. The 2009 Wright State University Student Employee of the Year is Nicole Kahle. Nicole has worked for the Department of Biological Sciences for three and a half years in the Biology and PreHealth Student Services office. Nicole's outgoing and friendly personality quickly led to increased responsibilities in the very busy, high call volume, advising center. She immediately adapted to scheduling appointments for multiple advisors, creating newsletters to assist in communications between the department and students, implementing a new filing system for undergraduate files, and maintaining information sheets and curriculum guides for all undergraduate and graduate students. Nicole’s commitment, loyalty, passion and bubbly personality are qualities truly valued by faculty, staff and students. With her strong work ethic and ability to multi-task, she serves as a role model and mentor to other student employees. Nicole grew up on a farm in the small town of Glandorf, Ohio and is a graduate of Ottawa-Glandorf High School. She is planning to graduate in June and pursue a career in nursing, specializing in a high acuity field. Nicole was recognized at a reception in Millet Hall on Tueday, April 14, during National Student Employment Week. Nicole is a “one-of-a-kind” and truly deserves this recognition. Congratulations, Nicole! Matthew Thomas Skira, Community Director, Hamilton Hall Office. Melissa Steinke, student employee in the Reading Center at the Lake Campus, was selected as Wright State University's Student Employee of the Year. In addition, Melissa competed at the state level and was selected as the winner for the state of Ohio! Melissa was nominated by her supervisor, Judy Brewer, a faculty member in Education and Human Services at the Lake Campus. She was recognized at a reception at Lake Campus on Thursday, April 17, 2008, during National Student Employment Week. Her co-workers had the opportunity to congratulate Melissa at a private reception following the presentation hosted by Career Services. "Melissa Steinke is a senior at Wright State University-Lake Campus, majoring in Middle Childhood Education with concentrations in Math and Science. After graduation this spring, she will complete her fifth year at the WSU-Dayton Campus, while also working toward obtaining her K-12 Reading Endorsement. "As a student assistant in the Lake Campus Reading Center, Melissa works long hours and is responsible for a variety of important tasks. For three years, she has worked maximum hours for the Reading Center (days, nights, summers, and every Saturday morning during the academic year) while also completing her class requirements in exemplary fashion — her current GPA is 3.609. She is also a published author, and she is an active volunteer for the Shelby County Big Brothers, Big Sisters program. "For the Lake Campus Reading Center, Melissa is responsible for monitoring student enrollment, which involves processing forms, confirming enrollment with parents and maintaining confidential files. She also arranges student assessments, which again involves parent interaction. In addition to students and parents, she corresponds with school administrators to arrange assessment sessions, and she often travels to the schools to act as an on-site supervisor for those assessments. When I think of Melissa, I think of a hard worker with a determined spirit … I also think of her as a future ‘Teacher of Excellence.’ This is a young person who wants to make a positive difference." Dr. Donna Schlagheck, Chair/Professor, Political Science. Paige M. Piper Layne Crawford Modern Languages Dept. Scott DeHart is a sophomore pursing a degree in management with a minor in French. Scott works as a student assistant in the Department of Modern Languages. Conducting language placement tests, greeting visitors to the office, responding to numerous and various inquiries, and drafting correspondence are just a few of his duties in Modern Languages. The department values Scott’s creativity, initiative, and his ability to treat everyone with respect and courtesy. Originally from Chillicothe, Ohio, Scott returns to his high school to promote the importance of taking foreign language classes. He is a 2005 graduate of Unioto High School. Scott’s career goal is to work for an international organization blending his skills and knowledge of management with the French language. "Scott is the most mature, polite, professional and dedicated student worker I have ever seen. He greets people, on the phone or in the office, in a way that makes them feel at ease; he listens to them and quickly ascertains what they need. "Scott is incredibly creative. When things were slow in the office for a week or so one time, he invented a computer game to learn vocabulary words in a foreign language that our whole faculty uses. "’Above and beyond the call of duty’ is Scott DeHart’s middle name. In addition to working in our office, he does things like go to our Majors and Minors Meetings to help us put out refreshments and clean off the tables when meetings are over. "Scott averages 30 hours a week in our office and is active in many extracurricular activities, and yet his grades never suffer. He is majoring in management with a GPA of 3.93. Scott does everything well." A reception, held on April 9, 2007, during National Student Employment Week, recognized Scott for his selection as Wright State’s Student Employee of the Year. Dr. Dan Abrahamowicz presented Scott with a Wright State University watch and a certificate recognizing Scott’s contribution to Wright State and the Department of Modern Languages. Scott also received a gift certificate from the office of Career Services recognizing his selection as the Student Employee of the Year. Congratulations, Scott, for your dedication and efforts on behalf of the Modern Languages Department. Amanda Smith was selected as the 2006 Wright State University Student Employee of the Year. Amanda is a junior Social Work major and business management minor at Wright State University. She is currently in the Honors program with a 3.7 grade point average. Originally from Dayton, Ohio, Amanda is a 2003 graduate of Stebbins High School. Amanda was nominated by her supervisor, David Jones in Center for Urban and Public Affairs, where she has been a student employee since the fall of 2003. She began as a telephone interviewer in the survey research lab, conducting surveys on behalf of governments and non-profit organizations. In the two and half years that she worked for the research center, she has been promoted to supervisor of the survey lab and has had the opportunity to work in different capacities on numerous research projects that the Center has conducted. While a student at Wright State, Amanda has taken part in the Peer 2 Peer program and has served as a tutor for the Ohio Reads program. She is an active member and former treasurer of the American Humanics Student Association, a non-profit certification program on campus. She is also a member of the American Association for Public Opinion Research (AAPOR), a national organization dedicated to excellence in survey research. "After completing a research project in 2004 about the impacts of high school preparation on student success, Amanda expressed a desire to explore the topic further. With this is mind, she and a fellow CUPA employee developed a 65 question survey aimed at exploring the role of high school preparation on student career and college planning. In order to ensure the validity of her survey, Amanda sought out the expertise of many WSU faculty and staff members to gain their input. "Using Southwest Ohio as her target area, Amanda developed a sound methodology to obtain a representative sample of all public high schools in Southwest Ohio. After having her survey and methodology approved by the University's review board, she began contacting her target schools in order to gain permission to conduct her research. "Today Amanda's survey is being implemented at more than 40 high schools in southwest Ohio. In all, between 4,000 and 5,000 high school juniors and seniors will take part in this survey. Many high schools Amanda has worked with have expressed a desire to conduct this survey on an on-going basis in order to measure the impact of changes each school may make as a result of survey findings. This in itself has positioned Wright State University to be at the forefront of education research for many years to come. "After data collection is complete, Amanda will enter and analyze the completed surveys, and will prepare a journal article that she plans to submit for publication in late 2006. Additionally, Amanda has applied for and has been accepted to present her findings at the American Association for Public Opinion Research (AAPOR) conference in Montreal in May of 2006. "While these attributes are impressive, what I believe truly sets Amanda apart from other students is that she has conducted this research strictly in pursuit of knowledge. She took the initiative to seek out funding for her research and for her travel to the conference, as our office would have been unable to provide all financial support. While our office has been very supportive of this research project, Amanda has been responsible for its success. She has truly been a leader in advancing research at Wright State, and for that I believe she should be recognized." A reception was held during National Student Employment Week in the Millett Hall Atrium. Wright State University Provost Dr. David R. Hopkins presented Amanda Smith with a certificate and several gifts. Julie Todd, Career Services Assistant Director presented Amanda with a gift certificate and a check from Midwest Association of Student Employment Administrators (MSEA) for winning at the state level. Congratulations Amanda for a job well done! Wright State University Student Employee of the Year 2005: Kristin Megan Watts. Kristin Megan Watts has worked as a Student Environmental Health Technician since the fall of 2003. Her main responsibilities include weekly analysis of chlorine levels and coliform sampling of Wright State's drinking water and maintenance of records of infectious waste production, recycling inventory, storm water discharge, and storage of hazardous chemicals. Her supervisor, Steve Farrell says, "Kristin has been able to perform all her duties with little need for anything more than introductory direction. She is always able to take on a task and complete it in a timely and thorough fashion. The quality of her work always shows through." Dr. Dan Abrahamowicz presented the Student Employee of the Year Award to Kristin on Monday, March 28, 2005, in the lobby of Millett Hall. Her co-workers were able to congratulate Kristin following the presentation, at a reception hosted by Career Services. In addition to her student employment responsibilities, Kristin has been a member of Alpha Lambda Delta Honor Society, National Collegiate Scholars, Golden Key International Honour Society, Alpha Xi Delta Sorority, and Habitat for Humanity. She plans to begin graduate school in the fall. Thank you to all students participating in the Student Employment Program at Wright State University. Your work is valued and your efforts are appreciated.